Some compared her dress to a wedding cake. Some compared her outfit to a multi-flavored ice cream combo. Some compared her outfit to a float filled with flowers. On a more serious note, many questioned the relevance of her outfit to Filipino culture. 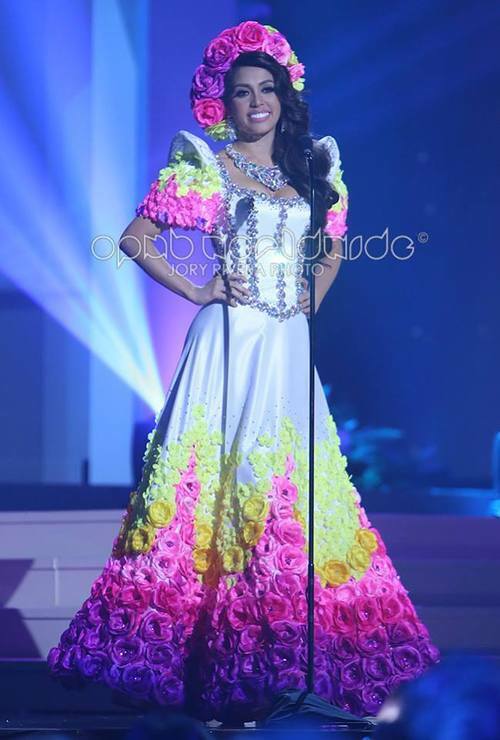 The question as to what in the Philippines does the costume represent may be a difficult one to answer for the designer and maker of the gown, Alfredo Barraza. He is not Filipino. He is Colombian. He is not even a Colombian who lives or frequently visits the Philippines. He is a Colombian who lives and has his own fashion line in Colombia. The only connection he has with the Philippines is his close friend, a Colombian who had married a Filipino and had been living in the Philippines for many decades now. That friend is Stella Marquez de Araneta, the Philippine franchise holder for the Miss Universe pageant for about fifty years now. Mrs. Araneta, then known as just Stella Marquez, was also a beauty queen in her youth. She was Miss International of 1960, representing Colombia of course. Mr. Barrazza has been making the gowns and costumes of Filipina Miss Universe delegates for more than ten years now. Filipino designers did that prior. However, years of designer rivalry, candidate lobbying and favoritism, and a “gown switching” incident, have all but eroded the trust of Mrs. Araneta in Filipino designers. This is why she turned to an old friend instead, Mr. Barraza; this according to chatter in pageant forums such as this. Many Filipinos never really cared about this arrangement with Mr. Barrazza, as Filipina delegates were perennial clappers (non-placers) at Miss Universe in the 2000’s. That changed when the delegates from the Philippines started doing well in Miss Universe and all other major international pageants. Also, starting at the turn of this decade, the online presence of Filipino pageant fans have become very significant. The two pageant sites currently with the heaviest web traffic, Sash Factor and Missosology, are both owned, controlled and administered by Filipinos. They are dominated by Filipino pageant forumers as well. All of these developments, have made the Philippines a formidable force in international pageantry. The Philippines has achieved the level of a pageant powerhouse, similar to Venezuela and the United States. Now, the hair, walk, figure, wardrobe and gowns of Filipina delegates all seem to matter. National costumes, which always had no bearing on a candidate’s score, began to matter since Filipina delegates now had to bring their “A” game. Outsourcing of “national” outfits in international events is not limited to pageants. Uniforms of Olympic teams worn during the opening parade has long been outsourced to foreign entities. There was an outcry when Ralph Lauren outsourced the manufacture of Team USA’s uniforms for the 2012 London Summer Olympics to China. In that case, Mr. Lauren, an American, designed the uniforms; the Chinese just made them. Not so for Mr. Barraza, who had a lot of freedom in designing and creating the Filipina delegate’s costume. Outsourcing has always been a sensitive topic in countries that actually do them. For countries that benefit from outsourcing, and the Philippines is one of them, the sentiment is much more positive. After all, the outsourcing phenomenon has been credited for the resurgence of the Philippine economy. Since Filipinos benefit from outsourcing, I don’t think this is the real issue with Miss Philippines’ national costume. No one would have complained if the outfit was beautiful. Ugly, whether outsourced or not, is ugly just the same. It’s for a beauty contest after all. Next Next post: Is the Miss Universe Pageant an Asset or Liability to Donald Trump?